Yesterday afternoon over 1,000 people gathered at Mill Creek Park in Kansas City for the Cosecha KC Rally to Protect Families to protest the treatment of asylum seeking immigrants and children by the Trump administration. 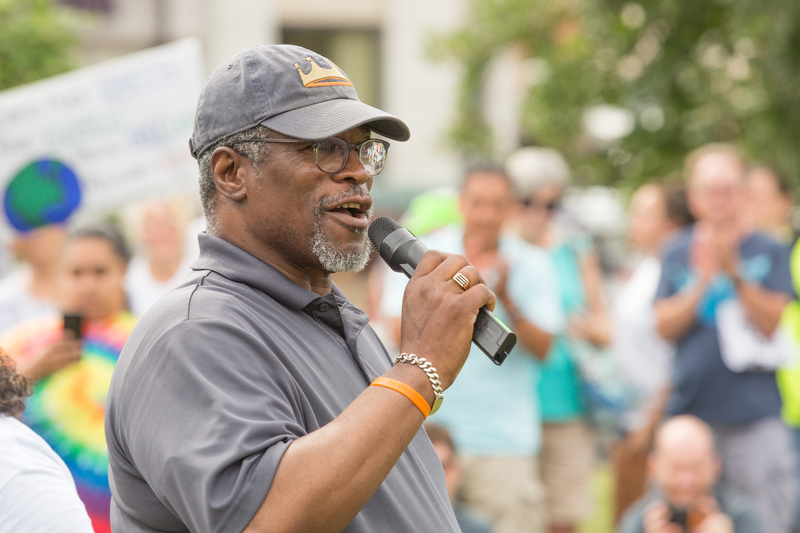 Kansas City Mayor Sly James spoke at the rally. 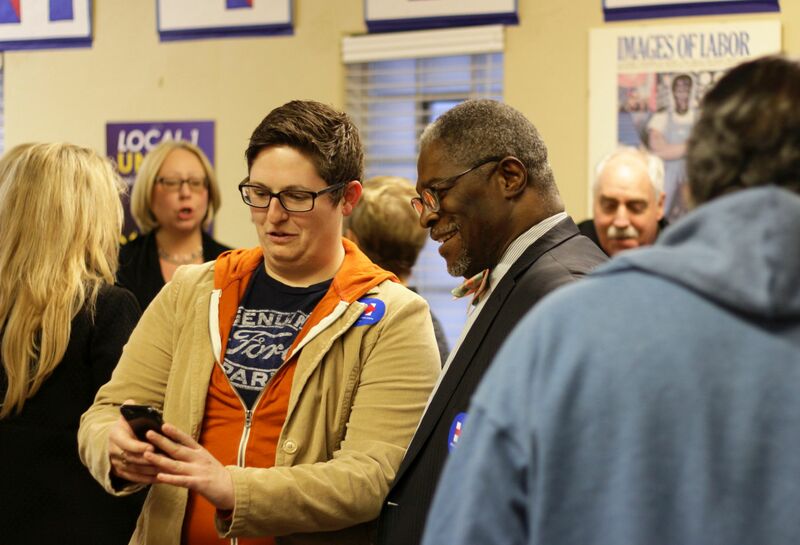 Mayor Sly James: [….] Good afternoon. [applause] Thank you all for being here to show the rest of the country, and everybody wants to listen and know, that this is how the American people feel . We do not support what’s going on in DC. [cheers, applause] The young lady mentioned that she had a couple of relatives in the Marine Corps. I was in the Marine Corps. None of us put on our uniform in order to see people stopped at our borders and caged and separated from their families. [cheers, applause] That wasn’t what we were ready to fight for. We were fighting for liberty, justice for all. For all. There were no limitations put on the all. It didn’t say all the people who are here. It didn’t say all the people who wanted to be here. It said all. And that has been lost in DC. This is nothing but politics. We have to stand and fight this because if we don’t at the end of the day it’s not about them, it’s about us. We define what our country is about. [cheers, applause] We are the ones who say what’s right and wrong. We’re the ones who unite families. We’re the ones that care. We’re the ones that live here. These are our neighbors. These are our friends. This is our city. It’s not theirs. 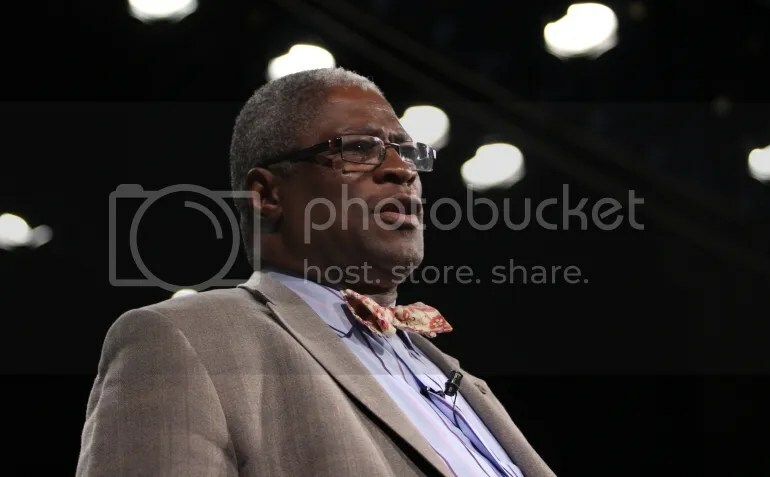 Kansas City Mayor Sly James (D) [2016 file photo]. Mayor, can you explain why gun sales skyrocketed from 2008-2016, and then slowed in 2017? Yeah. Fear of having a Democrat Black President is one reason. 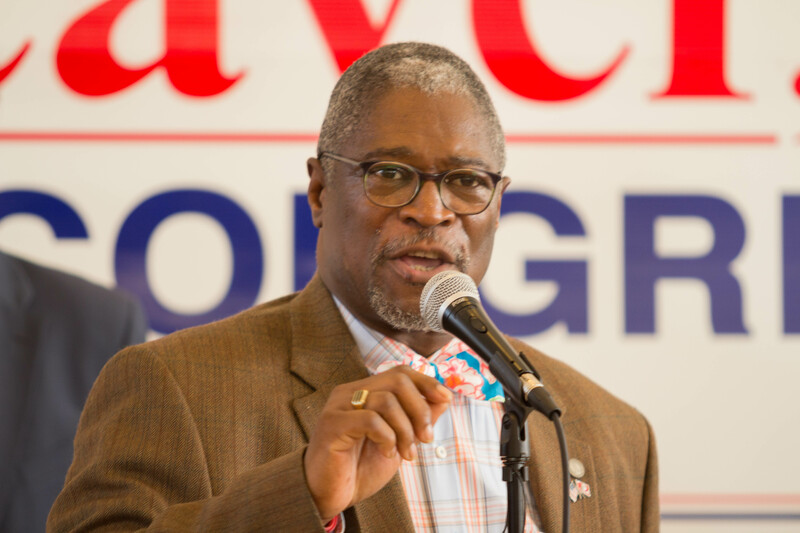 On Saturday afternoon Missouri Democrats held a get out the vote kickoff rally at Congressman Emanuel Cleaver’s campaign office in Kansas City. 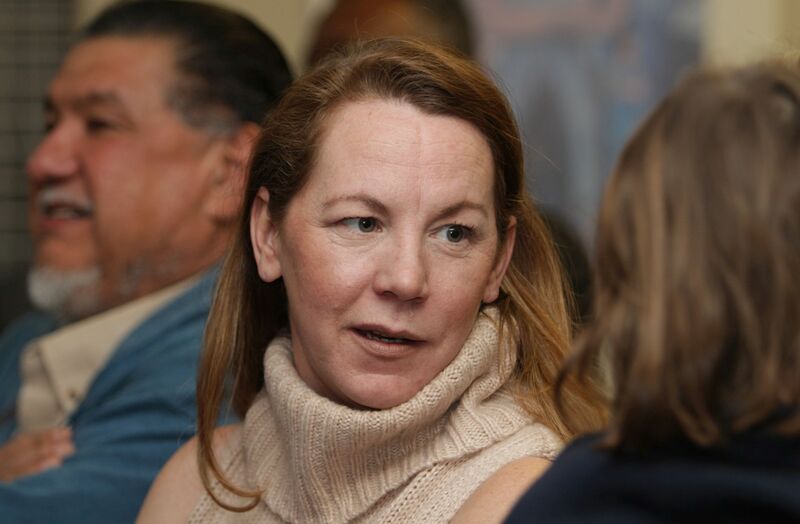 Several statewide office holders and candidates, local office holders and candidates, and approximately two hundred activists and volunteers were in attendance. 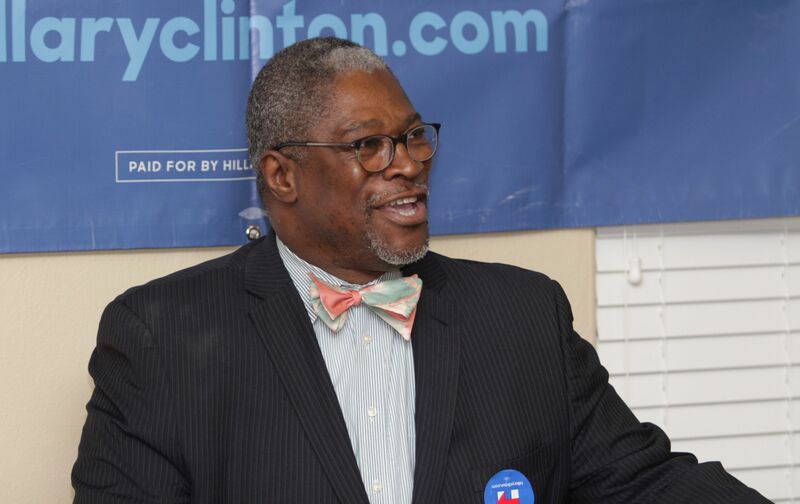 Kansas City Mayor Sly James (D), speaking at a GOTV kickoff rally in Kansas City – October 29, 2016. 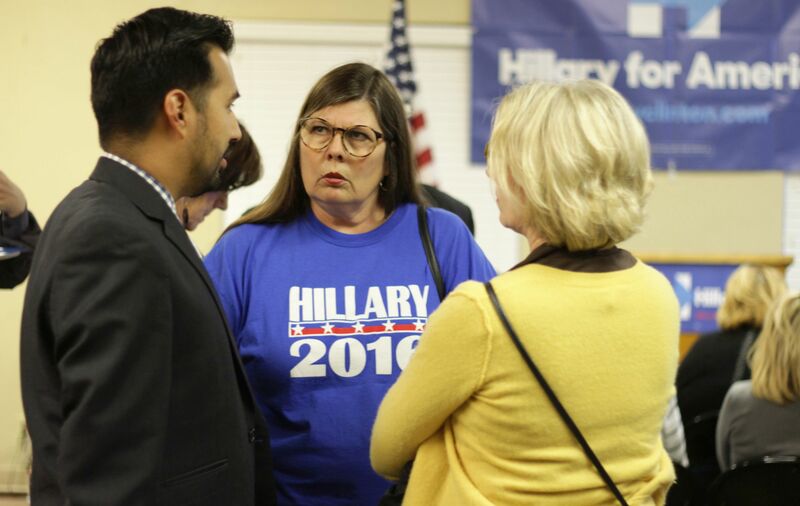 On Wednesday evening approximately 100 supporters crowded into the building for the opening of Hillary Clinton’s presidential campaign office in Kansas City. Representative Emanuel Cleaver, Kansas City Mayor Sly James, and Jackson County Prosecutor Jean Peters Baker addressed the crowd. A number of candidates and office holders, statewide and local, also attended. 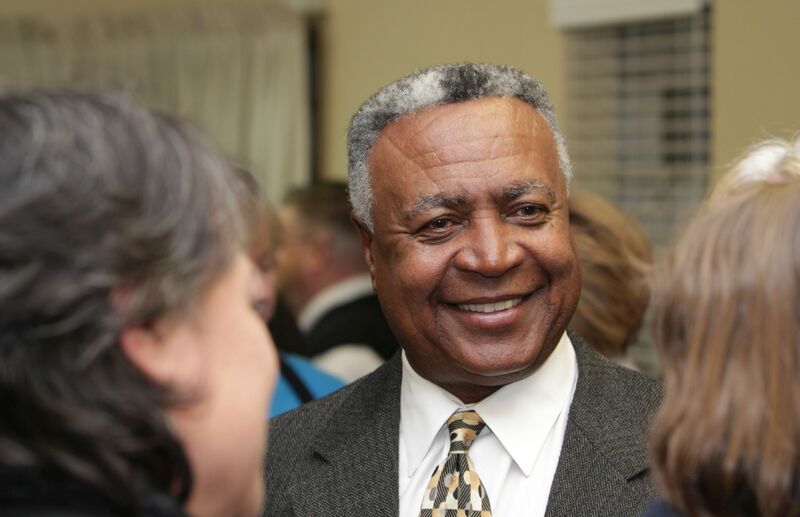 Jackson County Executive Frank White. 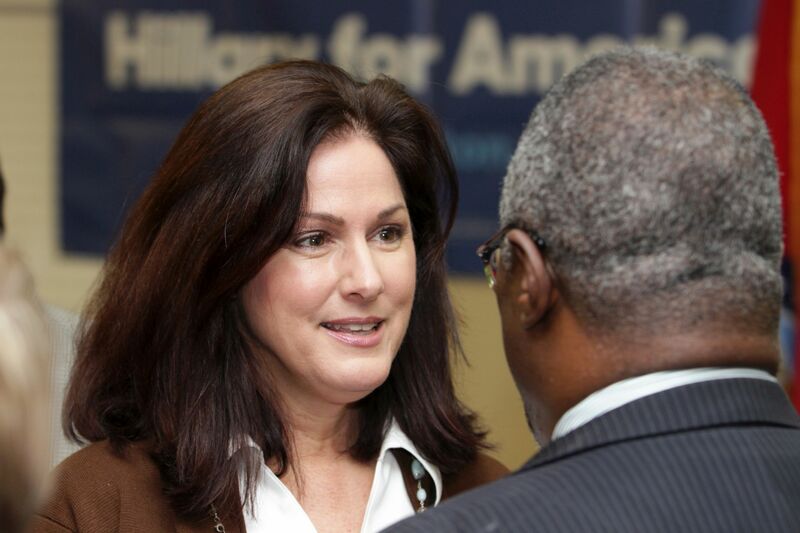 Judy Baker, a Democratic Party candidate for State Treasurer, and Mayor Sly James. 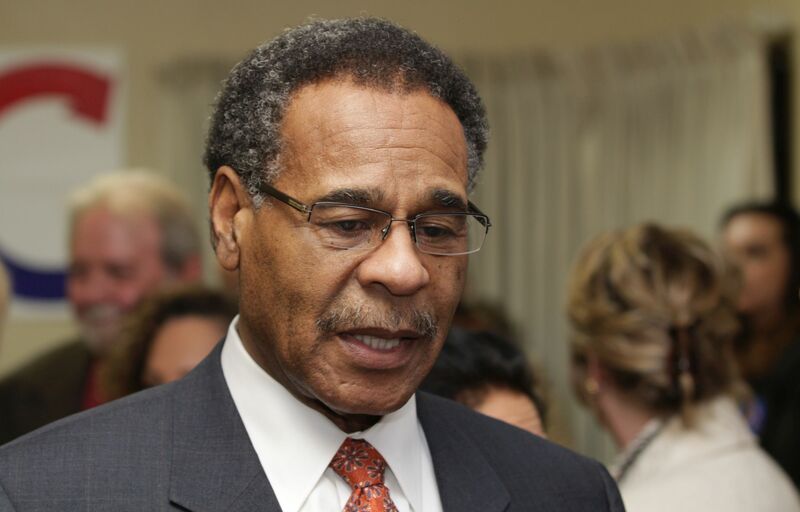 Representative Emanuel Cleaver (D) ….Only God can speak things into existence [voice: “Amen.”], the rest of us have to work them into existence…. Here’s what I know, Hillary Clinton knows more about the operation of the Federal government than all of the other candidates combined….There is a reason that many of the candidates are not giving answers to the questions, there is a reason….There’s a reason that people don’t give answers, and there’s a reason that when you listen to the debate you understand very clearly that there is a fine line that separates Hillary Rodham Clinton and everybody else. In depth answers to questions. [applause] ….Hillary Clinton does not promise more than she can deliver. But when she wins, she’ll deliver more than she promises. [applause]…. 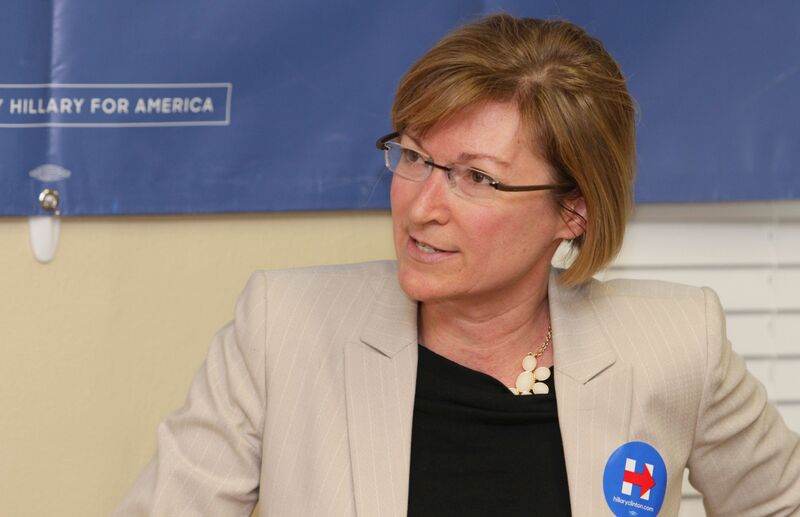 Jessica Podhola, a Democratic Party candidate in the 11th Senate District. 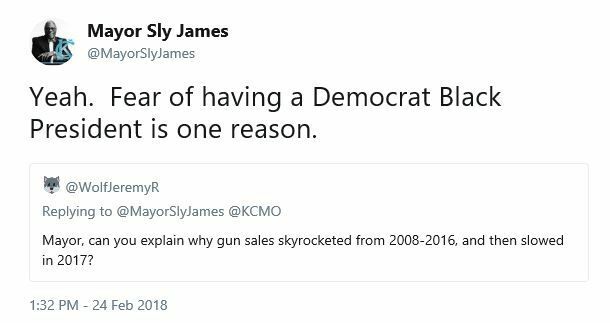 Kansas City Mayor Sly James. 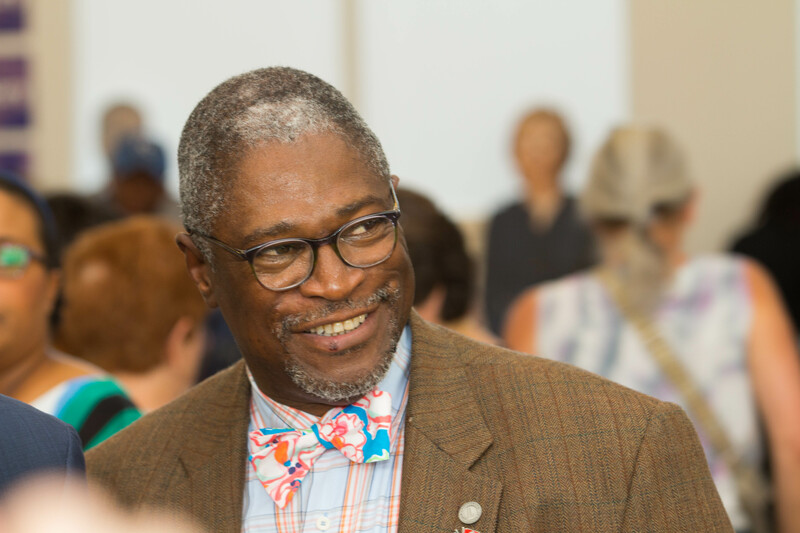 Mayor Sly James: ….We are facing, perhaps, the most crucial election of our lives. We have so many issues that we need to work on. 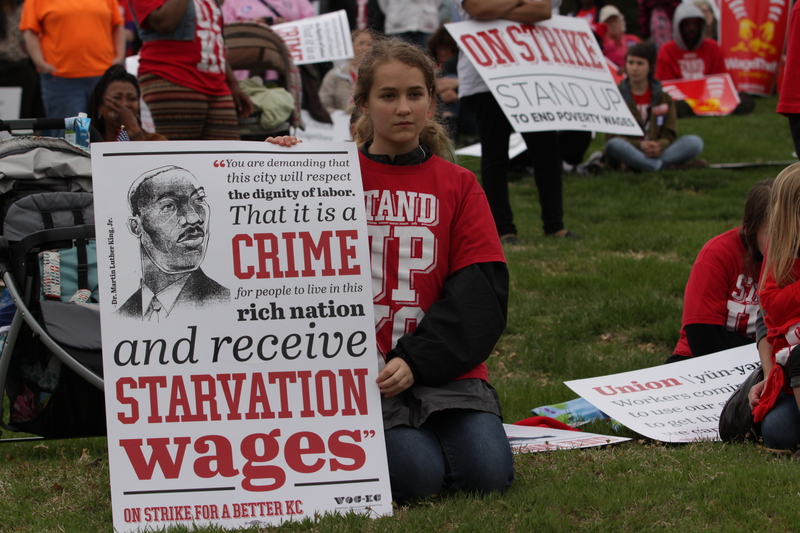 We have people that don’t have a living wage. We have people that can’t get insurance. We have a society where it is a right to own a gun and a privilege to have insurance…. We have kids that need early childhood education. We have infrastructure that needs t be rebuilt…. We need serious people to deal with these problems…. If we really care about this election, if we care about this country, and if we care who sits in the White House, if we care about our children, then we will work our tails off to make sure that Hillary Clinton’s elected…. Jackson County Prosecutor Jean Peters Baker. Jackson County Prosecutor Jean Peters Baker: …. It is time, it is time for a qualified, experienced woman. 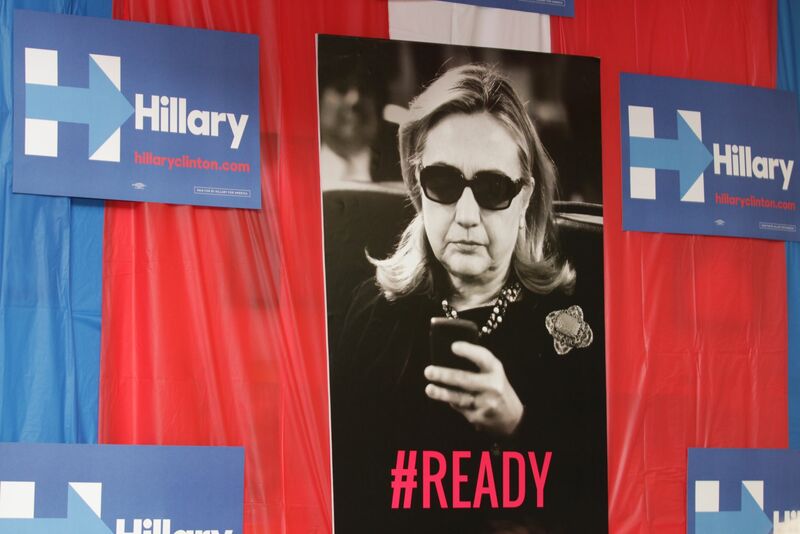 [applause] So it is time for us to get to work, lean in, show up, knock doors, and that’s it…. Preparing to take a selfie with the Mayor. Some of the office decor. The municipal general election in Kansas City is on Tuesday, June 23rd. 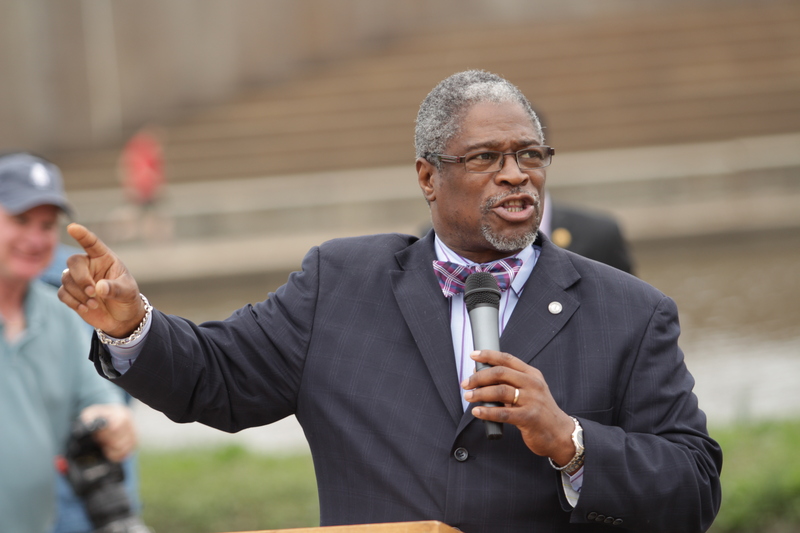 Kansas City Mayor Sly James [2014 file photo]. In Kansas City, in addition to mayor, there are city council seats and the retention of municipal judges on the ballot [pdf]. 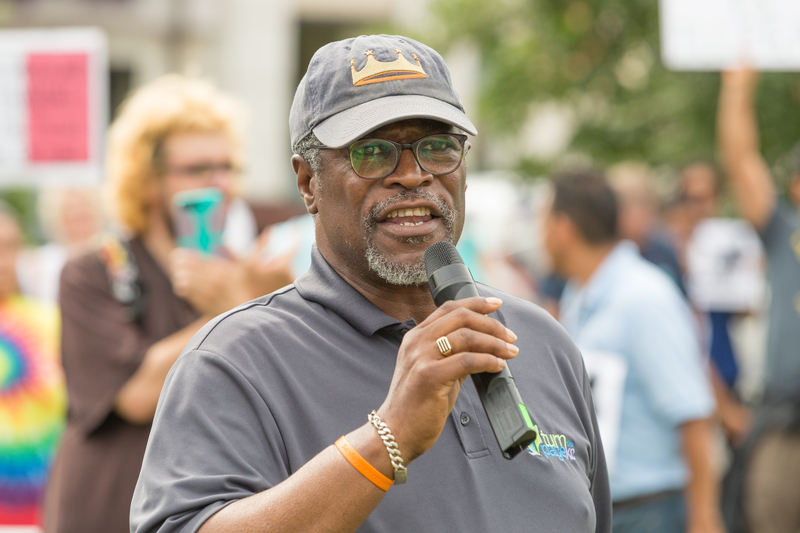 Kansas City Mayor Sly James spoke at yesterday’s “Fight for $15” rally and march. 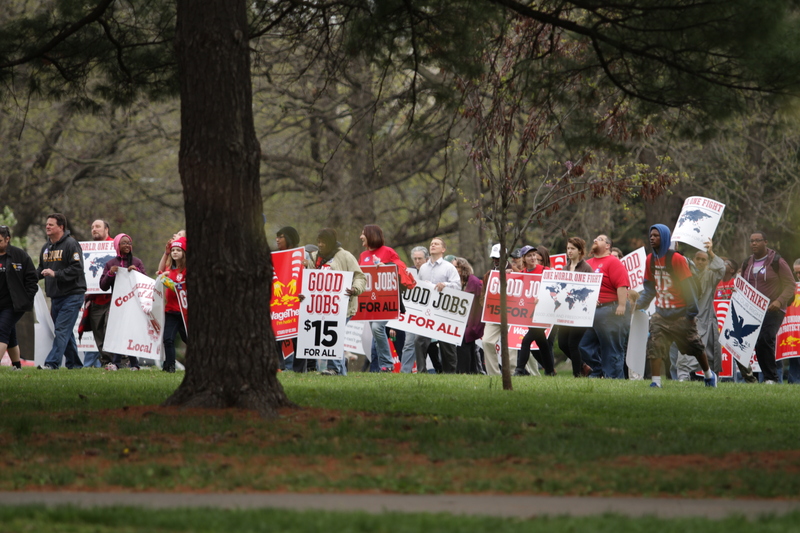 Yesterday evening approximately one thousand people gathered in Theiss Park in Kansas City for a rally and march in support of increasing the hourly minimum wage. 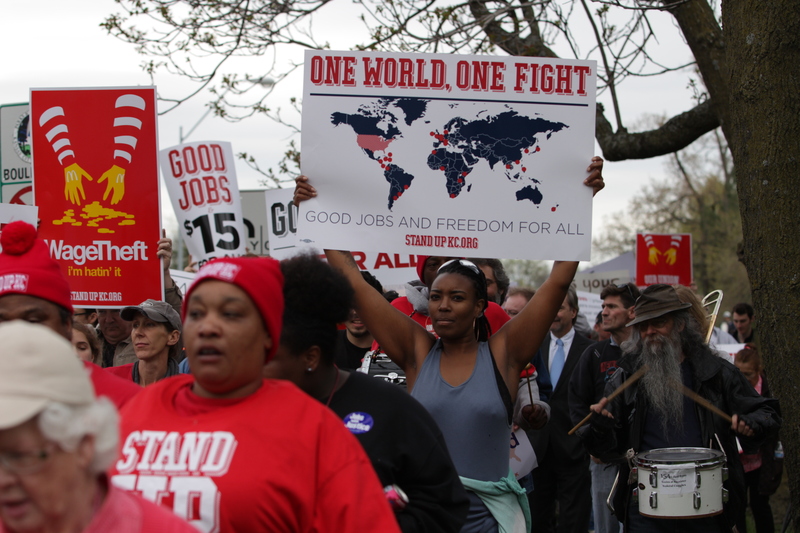 The organizers and crowd included a mix of food service and service industry workers, organized labor, university students and adjunct faculty, faith leaders, and Kansas City office holders. We are fast food and retail workers from across KC coming together to demand good wages and a voice for low-wage workers. 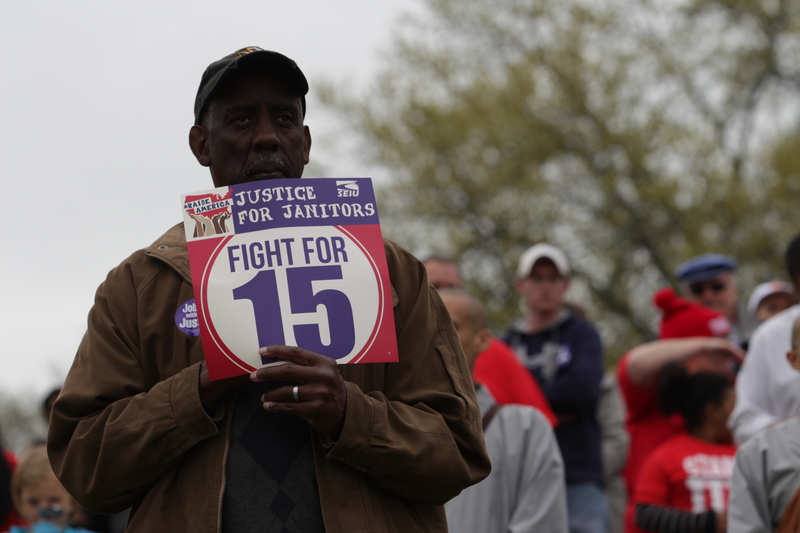 Today, 48,000 Kansas Citians are employed in some of the world’s largest and most profitable fast food and retail corporations. But they work in our city’s worst paying jobs. The average fast food worker is now 28 years old and the average retail worker is 38. Both make about $7.35/hour, have no healthcare, no paid sick days or vacation pay, and face daily discrimination. Top brands like McDonald’s make $5.4 billion in profit, pay their CEO $14 million, and have over 500 locations city-wide. It would take the average retail worker 823 years to earn what Walgreens CEO Greg Wasson earns in a year. But fast food and retail workers won’t accept these facts any longer. 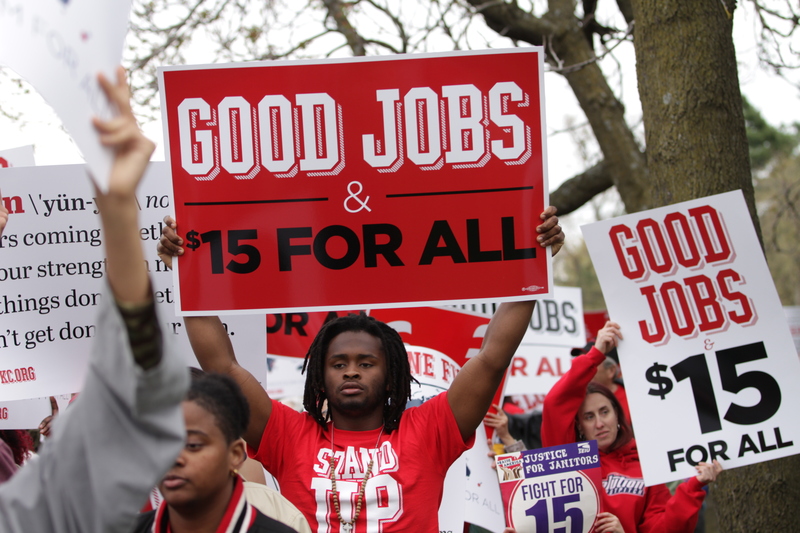 Right now fast food and retail workers are sticking together to fight for higher pay so they can afford basic needs, like groceries, housing and transportation. Stand with us as we stand up for our city and our futures! Kansas City Mayor Sly James: ….The one thing that we always must remember is, is that nothing is going to happen unless we act together. If we do not act together we will be picked off one by one, separated, culled from the herd, and nothing will happen. The only things that have changed the course of history in this country have been when people who believed in something fervently, people who are willing to give up their lives for it, people who are willing to devote their treasure to it, combined with others to do the same thing and stuck together until it happened. It is immoral, it is unjust, it is unreasonable, it is unforgivable, it is unexplainable that we all live in the richest, most powerful, best country in the world and people work forty hours a week and cannot feed their families. People work forty hours a week and cannot put food on the table, cannot buy the clothes that they need, cannot take care of their children’s needs, cannot access health care, cannot do things that other people do and take for granted. It is time for us to recognize that and it is time for it to stop. 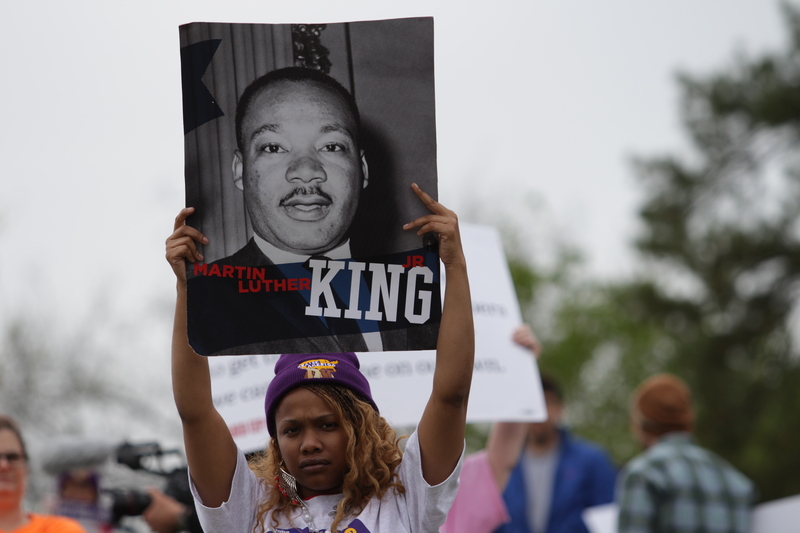 After a relatively brief rally with speeches the crowd marched from the park through the neighborhood and up to the University of Missouri – Kansas City campus. The start of the march. 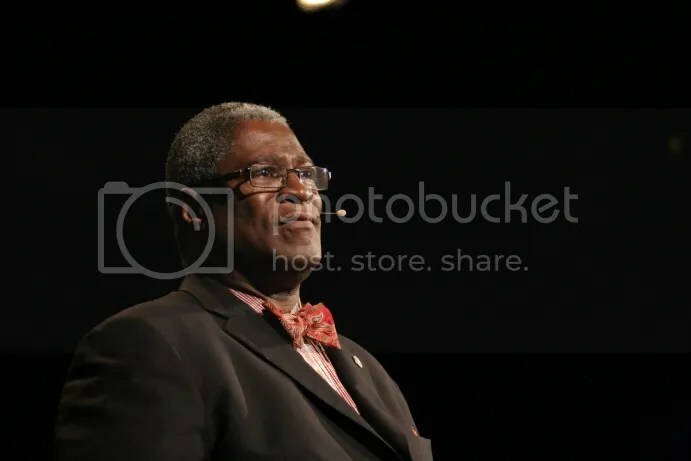 Kansas City Mayor Sly James spoke in Warrensburg on Sunday evening for the 75th session of Missouri Boys State on the campus of the University of Central Missouri. 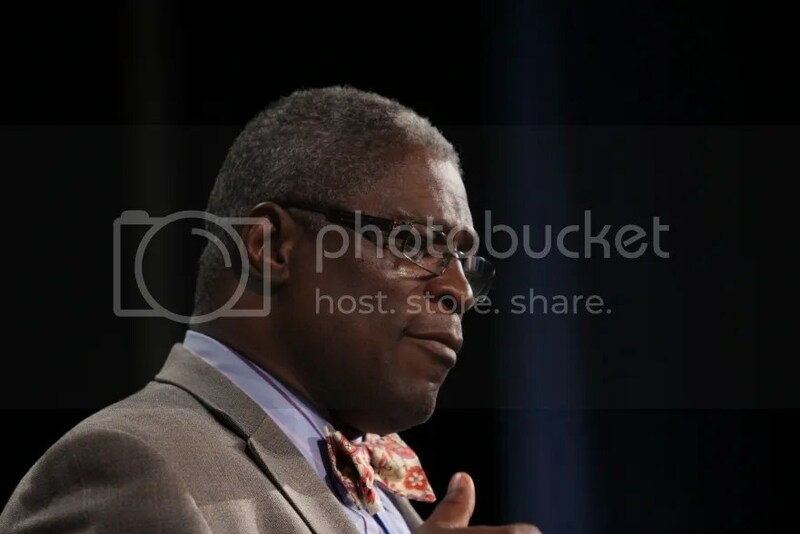 Kansas City Mayor Sly James speaking at Missouri Boys State in Warrensburg – June 15, 2014. 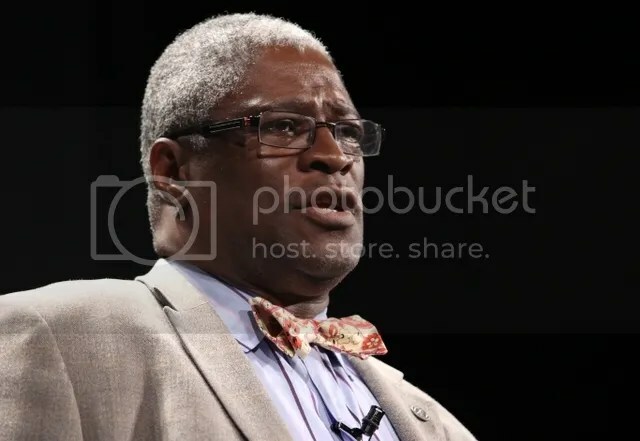 Kansas City Mayor Sly James: [in response to a question about gun violence] …Well, one way of keeping hands out of the, guns out of the hands of criminals is to stop people from selling them to them, uh, should abide by the law. And when you go to gun shows in Missouri or a back car, or a back trunk of a car you don’t have to comply with any background checks unless you’re a federally licensed gun dealer. So, when it’s easier for a kid, a sixteen year old kid to get a gun than it is for him to get driver’s license I got a problem with that. So, yes, we do need to do that. How about some sensible things like everybody who buys a gun needs to be registered? It’s interesting to me that everybody who drives a car, which can be considered an instrumentality of death when you think about it, because by driving a car drunk, by driving a car when you’re incompetent, by driving a car out of road rage you can kill somebody. Every single person who drives a car is supposed to have a license. But everybody who owns a gun does not have to. I’m sorry, that does not make logic to me. It’s great for ideology, it’s bad public policy. [applause, cheers] We do not need [inaudible]. There’s some very basic common sense rules and things that can be done that will not interfere with Second Amendment rights but will help keep the guns out of the hands of people who are mentally incompetent, past felons, or what, you know, stupid people. Okay? One is, if you as an owner of a gun have your gun stolen from your house you should be required to report it to the police, but you’re not. So, guns get stolen, we never know that they’re on the street, but the first job, one of the main jobs after a murder using a gun is trace it back to its origin. But when you have those gaps and we need to know something, maybe we know something about what’s going on in the neighborhood that we can connect somebody to. All sorts of things like that. But, the other thing, too, is there was a bill in the Missouri legislature that Mayor Slay in St. Louis, of St. Louis and I fought hard. It was a bill that basically said that federal gun laws could not be enforced by federal agents in the State of Missouri. And, in the original version of the bill local police really had the authority and the obligation to arrest a member of the ATF or the FBI or DEA, uh, who was enforcing a federal gun law against a criminal and that this, the federal agents could be jailed and fined and could no longer work as a law enforcement agent in the State of Missouri. One of the single dumbest rules and pieces of legislation I’ve ever heard in my life. Because every agent, every city that has police and every city that’s trying to do something about crime works with the federal government. They have resources that we need, they have, uh, things that we simply can’t do, and it’s a partnership. It would have destroyed KC NoVA. All of our partnerships would have been wiped out. 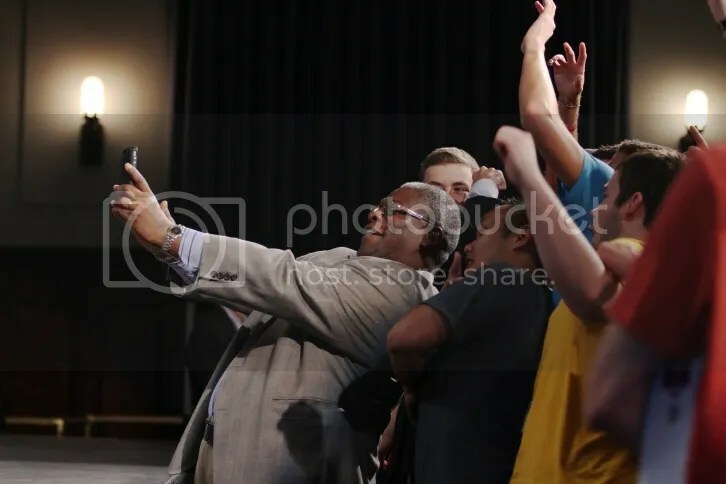 Kansas City Mayor Sly James took a selfie with the Boys State audience after speaking. “….None of these proposals deny a law abiding citizen gun ownership, nonetheless, I expect them to be met by some with vehement protestations and anger. But fear not upset friends. Nothing that I have proposed is very likely to be enacted in Missouri. You see, the Missouri legislature has made it legally impossible for cities like Kansas City or St. Louis to do anything substantive to stem the tsunami of illegal guns into the hands of criminal idiots on city streets. I don’t harbor any illusions that the legislative scheme will change anytime soon. If Newtown didn’t wake this country up, my proposals won’t change our laws…. 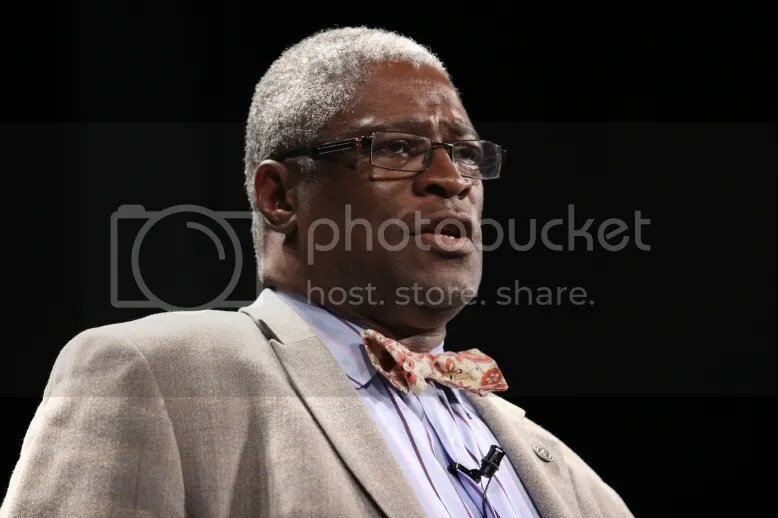 Kansas City Mayor Sly James (file photo). You asked. I’m answering: What are we doing about gun violence in KC? ….We can and should, as a city, have the ability to have laws and ordinances that address our specific circumstances. Ban assault weapons in vehicle passenger compartments in the city. None of these proposals deny a law abiding citizen gun ownership, nonetheless, I expect them to be met by some with vehement protestations and anger. But fear not upset friends. Nothing that I have proposed is very likely to be enacted in Missouri. You see, the Missouri legislature has made it legally impossible for cities like Kansas City or St. Louis to do anything substantive to stem the tsunami of illegal guns into the hands of criminal idiots on city streets. I don’t harbor any illusions that the legislative scheme will change anytime soon. If Newtown didn’t wake this country up, my proposals won’t change our laws. Nonetheless, I can’t simply sit back and say and do nothing while we watch slow motion mass murder happen on our streets year after year. I’m sick of it. Families of murdered children, fathers, husbands, wives, and mothers are sick of it. We may be limited in how we can regulate guns, but we are not limited in our ability to build strong relationships between the community and the KCPD. We also have a network of social services, like job training and drug treatment, that can go far in helping individuals find a life outside of crime. KC NoVA does both of those things. Today, the stakeholders of KC NoVA reaffirmed their commitment to fighting crime in our City. This is about more than only throwing people in jail – it’s also about offering those individuals the option to reshape their lives so that we have more people contributing to the community and fewer shooting guns at each other. We are not deterred by the recent violence we’ve all read about in the news. On the contrary, we are emboldened by it. Once again there is a huge gulf between what we KNOW and how we ACT in light of that knowledge. That is our reality. What we can do now is have a tough conversation about what to do going forward. I have spoken openly and passionately about this before and I want to address everyone who asks what I am doing in the wake of all this recent tragedy…. Question: [….] Um, regarding your opinion on gun control. Instead of completely taking away our ability to buy guns at eighteen why don’t instead we give gun shops, you know, the ability to know who has a criminal record and who’s been in trouble in the past? Why don’t we give, let them have the ability to know that and do background checks and decide who they want to sell to? ‘Cause as store owners they are allowed to decide who they want to sell to. The odds for change are not good. on the campus of the University of Central Missouri on June 16, 2013. 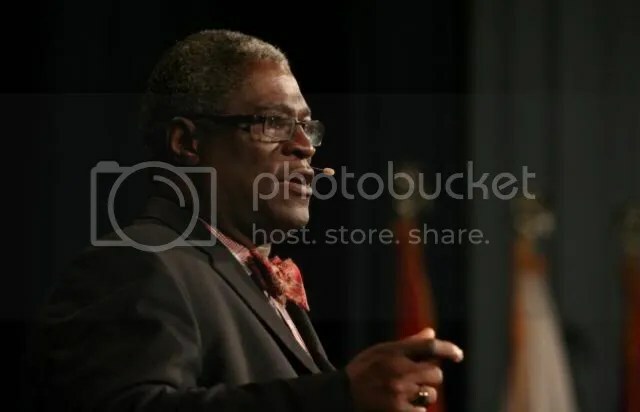 Kansas City Mayor Sly James was the keynote speaker for Missouri Boys State on the campus of the University of Central last night. He spoke for approximately forty minutes and then took questions from the audience.